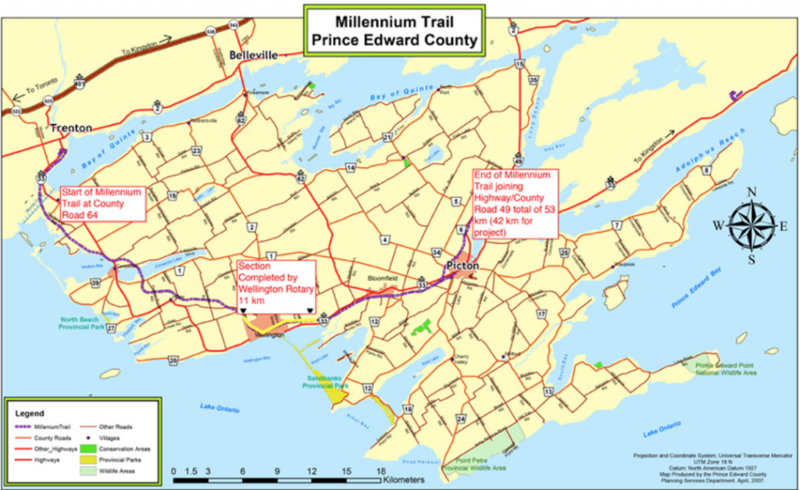 PICTON – The multi-use Millennium Trail that runs 46 kilometres across Prince Edward County will get an upgrade in the next few weeks. Prince Edward County is planning a three-year upgrade project in partnership with the PEC Trails Committee. The municipality has put $370,000 into the project and the trails committee has fundraised $110,000 – surpassing their original goal of $80,000. What is the Millennium Trail? The Millennium Trail is a re-purposed rail line that was converted into a multi-use trail for County residents and visitors. It’s intended for cyclists, hikers, snowmobilers, ATV riders and cross-country skiers, according to the County. The multi-use trail stretches from Carrying Place at County Rd. 64 to Picton at County Rd. 49, passing through Consecon, Wellington and Bloomfield. What is the three-year plan? The 11-kilometre section that runs from Danforth Rd., to Highway 33 by Wellington has already been upgraded thanks in part to the work of the Rotary Club of Wellington. “Barry Davidson, a resident from Wellington, has been more than helpful and we are certainly very appreciative of what Barry has contributed,” said Quaiff. Over the next three years, the trail will be upgraded in sections. Fall 2017: The County will resurface the trail from east of Wellington to Lake St. in Picton. 2018: Upgrade to the section heading west from Wellington to Carrying Place as well as the section heading north from Picton to County Rd. 49. 2019: The final year is dedicated to resurfacing the remainder of the trail. There will also be new signage installed on the entire length of the trail including kilometre markers, directional signage, interpretative signage, safety signs and information. “We have a couple of areas in the Consecon area where we are going to make environmental improvements to the wetlands to protect the small animals like turtles and things of that nature so they will be able to cross that trail safely,” said Quaiff. This is meant to be completed by this fall as well, according to the release. Brushing out overgrown edge area. Widening the trail to approximately 11 ft.
Re-grading the gravel and stone base. Topping with six inches of crushed limestone. Placing distance markers every kilometre. As for the next step, Quaff said the crew will begin this fall in brushing out the overgrown area and prepping the trail for upgrading. He said they plan on continuing as weather permits.